It has been awhile since I had baked bread! That needed to be remedied soon. With the temperatures soaring and hovering around the three digit marks, I didn't want to make anything fussy or that needed too much attention. Fortunately for me, at around the time I had decided to bake bread again, my library pinged saying that the copy of Bread Baker's Apprentice that I had reserved was now available. A sign indeed. I love Peter Reinhart's book. Yes, it can be a bit of a long process what with all the starters going poolish but then hidden in there are some same day gems! I picked one of those; a simple white bread recipe that I played with, just a tad, to make my fabulously buttery herby dinner rolls. Once you have bitten into these rolls, you won't ever go back to the store bought ones. I promise! And, they come together very easily too. After my pizza dough, I think this is the simplest one I have made! Once I baked these lovely rolls, I could hardly wait until dinner to bite into them. It's like the forbidden fruit, one bite and you are hooked! :) So well, to get around eating just bread, I thought we might as well make a light snack of it. Hence the pesto was born and in the vein of using my farm produce, I decided to use the garlic scapes in place of normal garlic in this pesto . 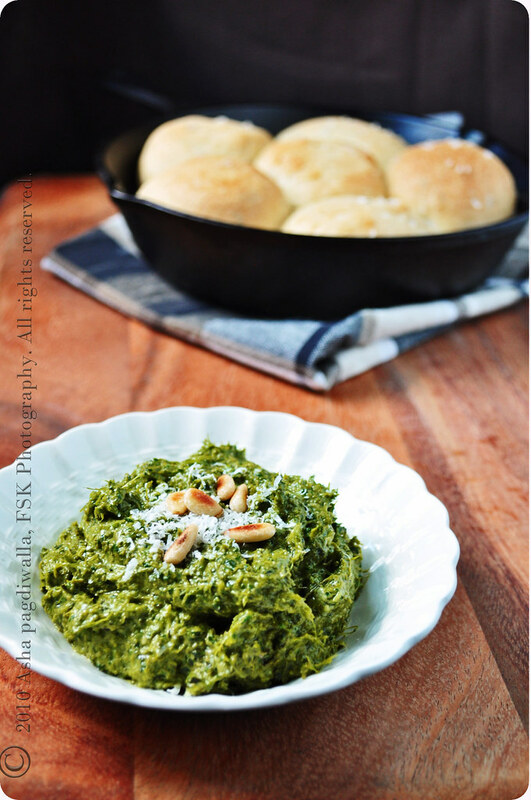 As simple as that, a teeny substitution and you have this wonderfully mild pesto bursting with flavors of the fresh basil, green garlic and subtle hints of lightness from the grapeseed oil I used in place of the heavier olive oil. Verdict: These rolls were perfect! (yes, I know, I already said that! But, it wsas good enough to keep repeating!) They are light, buttery and simply the softest rolls, I have bitten into. 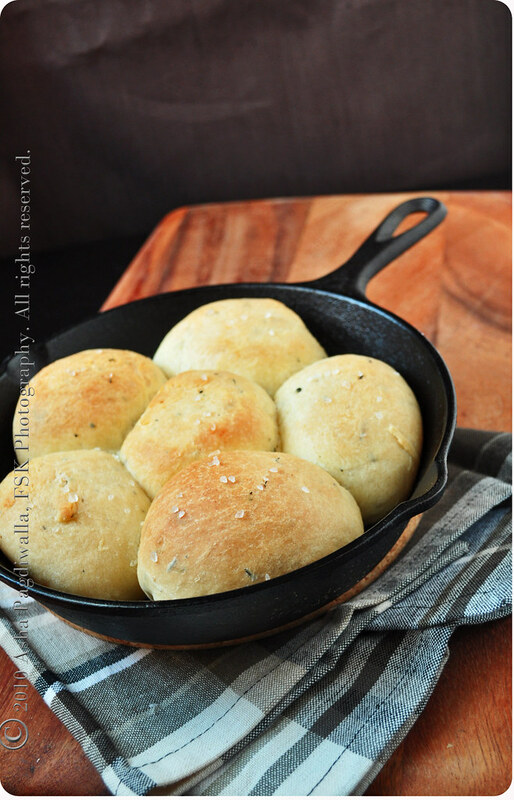 Adding the summer savory introduced another layer of flavor that worked so well with the buttery texture of the rolls. 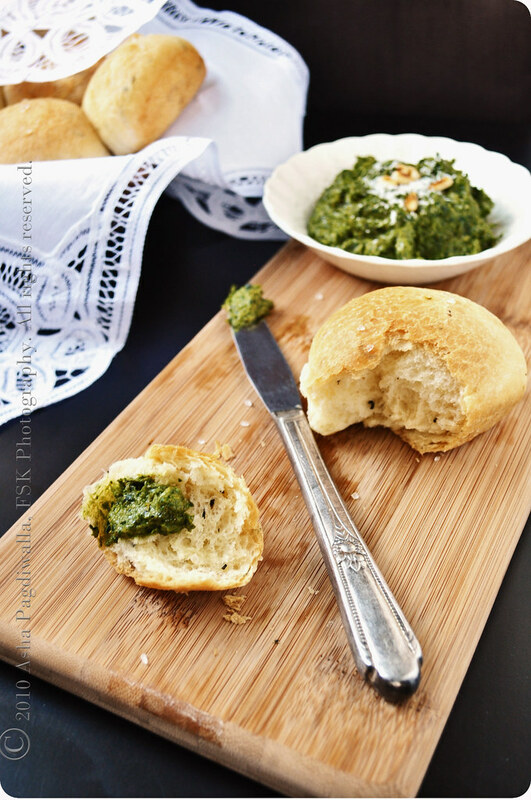 As to the pesto, it was perfect accompaniment for the rolls. We happily chomped through 6 rolls at one go, fresh out of the oven! Reinhart , mentions three variations of the recipe including one with a starter. The one I used for these rolls use milk powder and water rather than milk. I am going to try out the other recipes as well and will update on what I find best. In the meantime, I will put my full faith behind this one! :) I am also sending some of this buttery love to YeastSpotting. 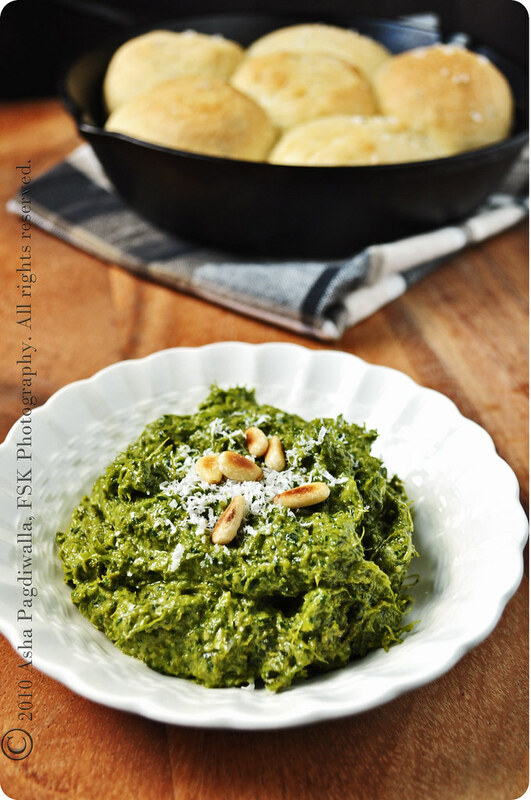 In a food processor, pulse the scapes, basil and nuts to a coatse paste. The mixture will be a brit stringy from the scapes, don't worry. Now, while pulsing, slowly drizzle in the oil to create an emulsion. Remove to a bowl and season to taste. Fold in the cheese and it's ready to be served. Mix together 2-1/ cups of flour, the salt, powdered milk, sugar, yeast and herbs. Pour in the egg, butter and water and mix until a dough ball forms. At this point if the dough is very stiff, trickle more water 1 T at a time until the dough is supple and soft. Transfer the dough to a lightly floured surface and knead, adding the remaining flour if necessary, to create a soft, supple and tacky dough that is not sticky. Continue kneading for about 8 minutes (if you don't have a kitchen aid, like me, this is good bicep exercise. actually too good! But this is the only effort part of this recipe..). The dough should pass the windowpane test and register an internal temperature of 80F. Transfer the dough to a lightly oiled bowl, rolling it to coast with oil. Cover with a plastic wrap or kitchen towel and let it raise at room temperature until it doubles in size (about an hour). Remove the fermented dough, gently degas and divide into dinner rolls (about 2 ounce pieces. Spray the dough with oil, cover with towel and rest for about 20 minutes. Meanwhile, get your baking pans (I used a 8 inch cast iron skillet) ready by lightly coating them with butter. At this point, if you are not going to bake the rolls immediately, you can transfer them to a cake pan, cover with wrap and refrigerate. When you want to bake, leave them on the counter for about an hour to get them to room temperature and then follow the rest of the steps. Transfer the rolls to the pan, leaving an inch of space between them. Leave them to rise and double in volume (about 60 minutes). Meanwhile, pre heat the oven to 400 F. Brush the tops of the rolls generously with butter and sprinkle sea salt over them. Bake the rolls for 30-35 minutes until they are golden brown on top and make a hollow sound when knocked on the bottom. When you remove the rolls, baste them again with butter.